This May I'm teaming up with the wonderful Rask to bring you an evening nutrition talk, healthy food and plenty of hygge. There will be goodie bags, tasty food and a chance to expand your knowledge of good nutrition. Spaces are limited to 25 attendees so make sure to book by sending an email to hello@raskderby.co.uk before it’s too late. This 45-minute expert-led talk will focus on fad-free nutrition. We all know we should be eating a little bit better but what really counts when it comes to nutrition? Instead of nonsense or confusing recommendations, the focus is on real evidence-based advice that can actually change the way you feel and look. The talk is science-based but easy to understand, with the odd food-related joke thrown in. 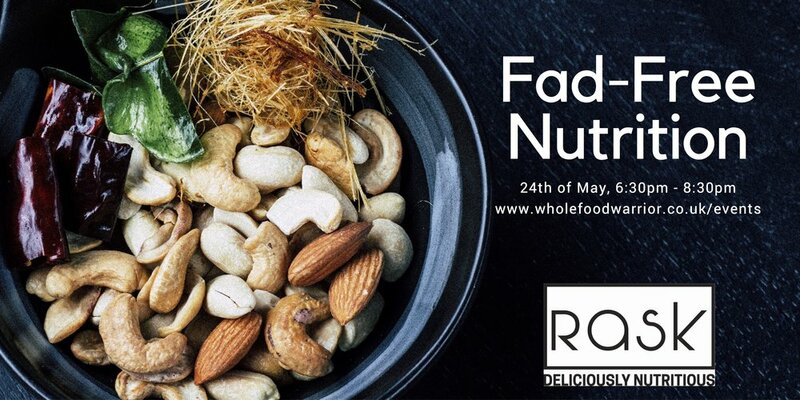 Rask bowls and energy balls will keep you nourished and staving off those hunger pangs following the talk. The team at Rask are well versed in creating beautifully tasty dishes that are super healthy too. All dietary requirements are catered for, just email hello@raskderby.co.uk if you have a question. Arrive for 6:30pm, the talk starts at 7pm followed by Rask bowls and energy balls. You are then free to chat, eat and relax. £20 will guarantee your seat for the talk and includes a Rask bowl and energy ball. To book, simply email hello@raskderby.co.uk and reserve a place.